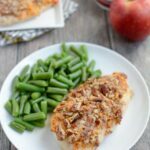 This simple recipe for Apple Pecan Chicken is made with just 5 ingredients and makes a great weeknight dinner. Put the apples in a paper towel and squeeze to remove excess moisture. In a small bowl combine apple, hummus and bacon. Pat chicken dry with a paper towel (or rub lightly with flour to coat) and place on a baking sheet. Spread hummus mixture on top of chicken to coat. Top with chopped pecans, pressing lightly into hummus to help them stick. Bake at 400 degrees F for 20 minutes or until chicken is cooked through. Optional – double filling and stuff some inside chicken as well as on top. [br][br]Check on the chicken after 15 minutes. You may need to cover with foil for the last few minutes if the pecans start to burn.